Different regions have their own take on this dish. Some deep fry the mock drumsticks, others have no breading. My husband's mother prepared it, "Pittsburgh style" (breaded, sautéed, baked, and served with pan gravy). 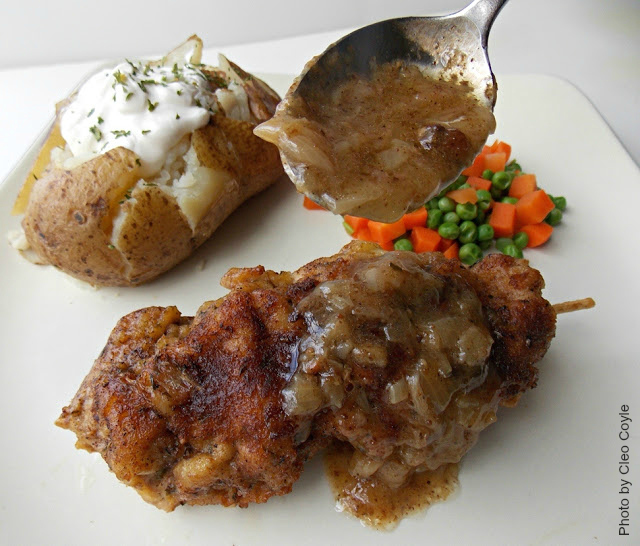 And that is the very recipe I'm sharing with you today, which also happens to be National Food on a Stick Day. City Chicken definitely qualifies. What? No Chicken in City Chicken? City Chicken, found in Pittsburgh, PA"
Step 1: Prepare the Meat - Arrange the meat pieces on each of the six skewers. 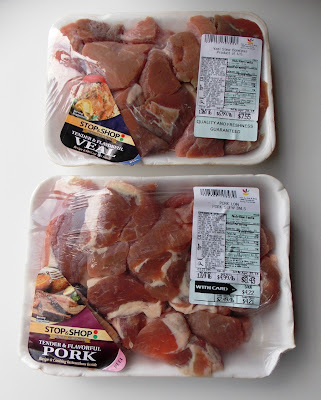 If using more than one type, alternate them (pork, veal, pork, veal, etc...) Fit the pieces together tightly to create a mock chicken drumstick. 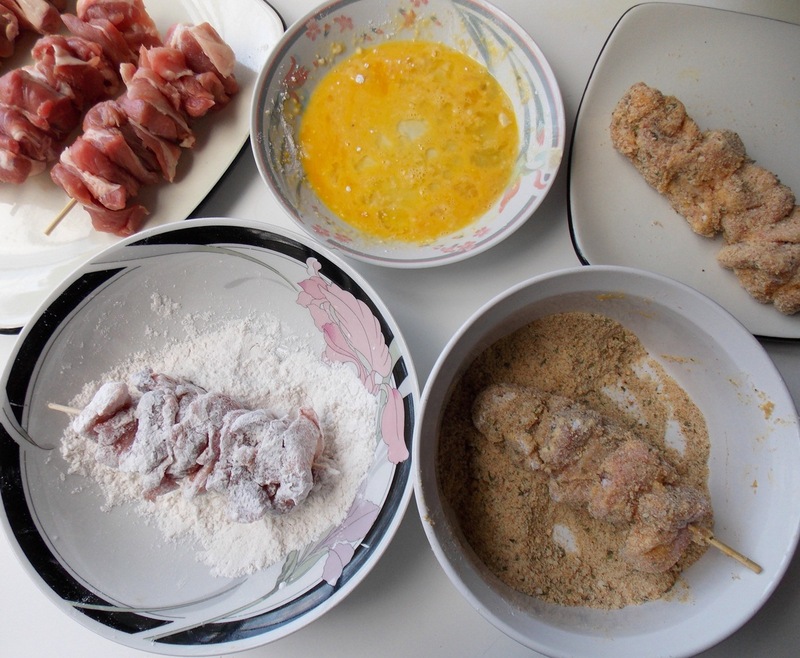 Dredge each of the mock drumsticks in flour, then in egg, and finally coat generously with the seasoned bread crumbs. 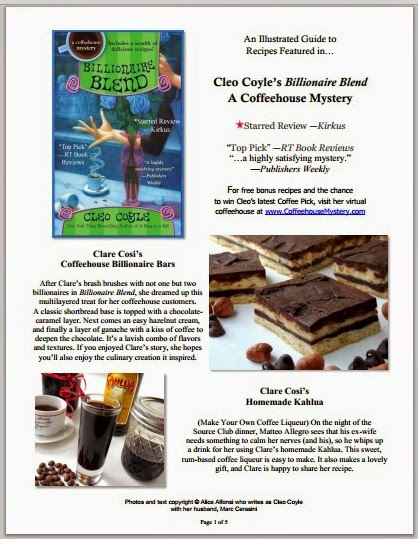 Subscribers to Cleo Coyle's Coffeehouse Mystery Newsletter left comments below to be part of a giveaway for a fun prize package.The winner of this giveaway (by random draw) was BECKY BRANT. And thanks to EVERYONE for joining in the fun and leaving comments. Stay subscribed to Cleo's newsletter so you won't miss the next chance to win her giveaways. Wow, not only does this look absolutely deliciously amazing, but if made a bit smaller, they would be perfect for cocktail parties!! I can see major grazing at the table for these! I remember having this when I first moved to Ohio. I always thought it was so funny to call something chicken that wasn't made from Chicken. This chicken looks yummy. I will have to try it. Thanks for the recipe. Looks great with all that gravy. Pictures ate making me hungry. Thanks for the recipe. This looks very appalling and I am going to try it very soon. Not something I've heard of here in Texas, but something I'm sure going to try. Who knew that there was a Food on a Stick Day. So many yummy possibilities. Delicious! Makes my mouth water just looking at it. this weekend and I am going to try it out for her. A family friend used to make city chicken every year for holidays. I love it. 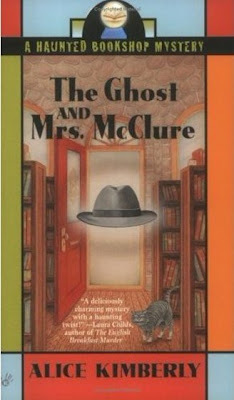 She died a few years ago so I'm looking forward to trying your recipe to honor her memory. Thanks for sharing it. 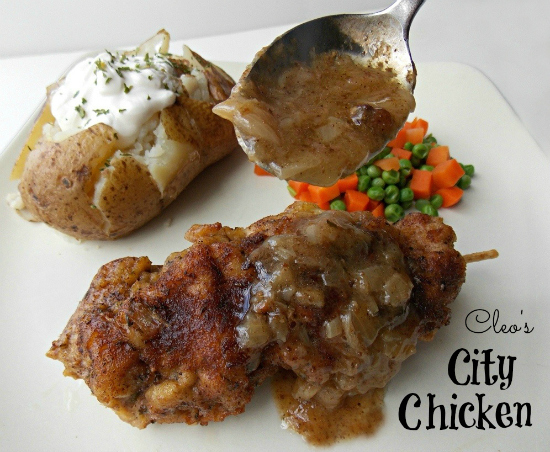 I have never heard of City Chicken before....recipe looks delish! Thanks for sharing!! I can't wait to try it. I have had some much success with so many of your recipes. That's a miracle considering I cook for four children and my husband. 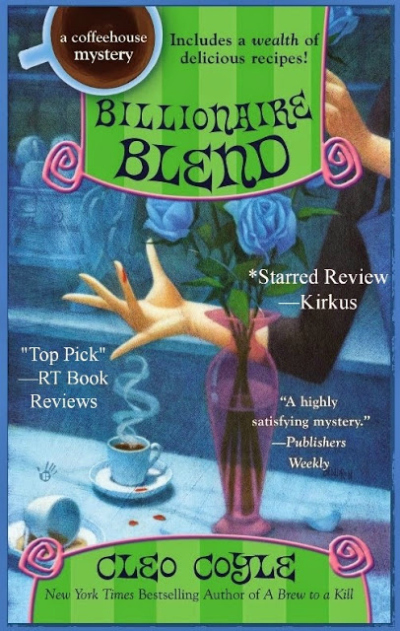 I look forward to your newsletters and each book. 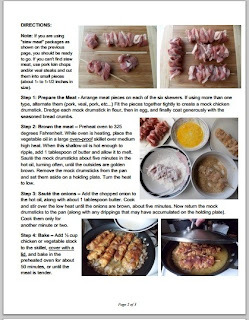 Thank you for sharing your recipe for "City Chicken". I haven't thought about that dish for years. We have lived in several states and the only place I ever found this labeled as "City Chicken" was when I lived in Pittsburgh. My husband grew up there and he always ate it as a child. Western PA has really blossomed as a culinary mecca. 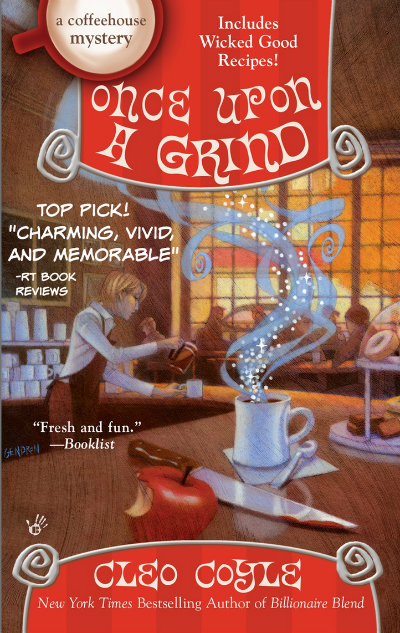 Now, if you could find the recipe for making the sauce for the chipped ham sandwiches...Yum. I have never heard of City Chicken. It sounds absolutely lip-smacking! The gravy; delicious. Your recipes are always so wonderful. Thanks so much for sharing. Love your books too. It sounds delicious. I thought my folks knew all the ways to cook cheaply. Guess not. I may have to try making it. Thanks sincerely to everyone for your wonderful comments on our City Chicken post. 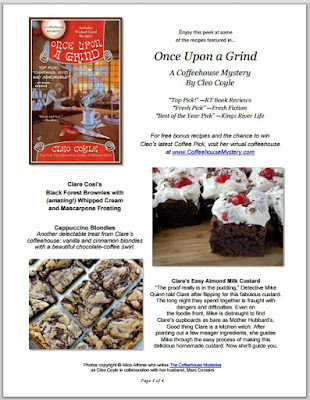 By random draw, we chose a winner among all of the comments to win our Coffeehouse Mystery Newsletter prize package...and that winner is Becky Brant! Congratulations, Becky, we hope you enjoy your prizes.